This is one of the three tents at the barbecue festival. 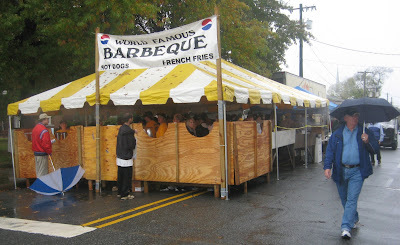 Area barbecue restaurants join together to make the barbecue for the annual Lexington, NC Barbecue Festival. This is the 25th year for the Barbecue Festival, but it still has a down home feel. 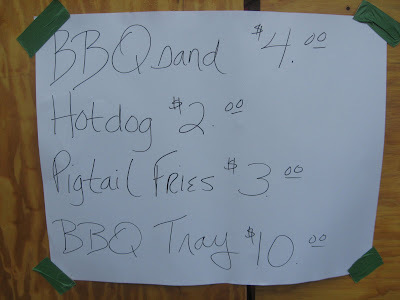 The barbecue signs are made by hand and taped on the plywood sides of the barbecue tent booths. 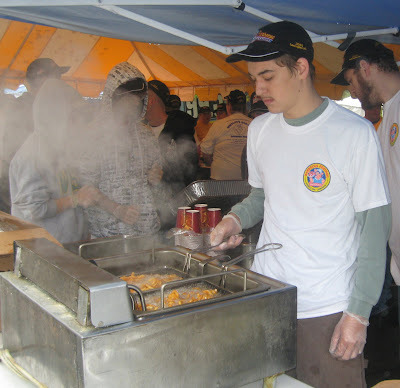 Behind the tents, they fry up curly tail French fries and also tend the sauce which has a vinegar base and a hint of tomato. The sauce at the festival is generally mild. For hotter sauces, you have to hit some of the barbecue restaurants in Lexington. You get your pork barbecue, slaw, and curly tail fries at the main booths. Pick up drinks from the various non-profit groups selling along the street. Is it just me, or does it look like this guy is swiping a barbecue sandwich? I know he wasn't, but it sure looks like it from the photo. Lexington, North Carolina is a big barbecue town. You will find many restaurants serving pork barbecue cooked over wood. Some restaurants cook with gas which is cheaper and easier, but those are not considered real barbecue restaurants in the area. Two good barbecue restaurants to check out are Lexington Barbecue and Jimmy's. There are lots of other good ones too, but those are especially popular in Lexington. 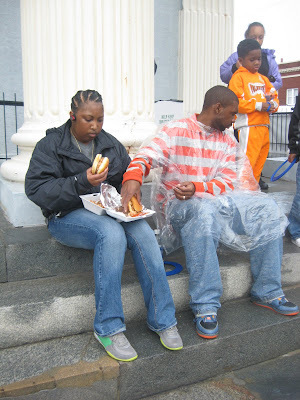 You can also visit at the end of October and try Lexington barbecue at the annual Barbecue Festival. They have three tents serving chopped pork on buns with sauce. They wrap those up, put them in a brown bag, and you are ready for a good Southern lunch. Most Southerners like slaw on the barbecue sandwiches or as a side with a barbecue tray. Barbecue slaw is different from regular slaw. It has more spice and a tang. It does make the bun a little soggy though. I'm not a big slaw fan, and that's something I don't usually tell. If I do eat it, I like it as a regular side dish and not running on my barbecue or dripping out of my bun. One thing I do miss when I eat at the festival is the hush puppies. Most of our barbecue restaurants serve hush puppies with barbecue. I guess it's too much work or they just don't have room to fry hush puppies at the festival. 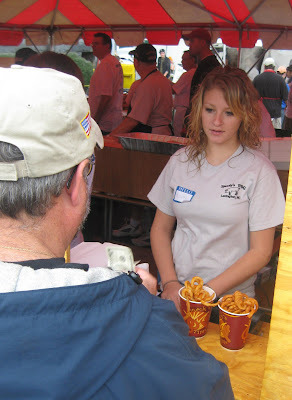 They do have curly tail French fries at the festival. Most barbecue joints do fries, but they don't put a lot of focus on those. You'll generally get frozen fries dropped in oil. The meat takes so much work and is really the focus, so the side dishes are usually just that - sides. Some barbecue restaurants serve Brunswick stew with the pork. In my area, we don't see that often. We're more likely to have Brunswick stew as a main dish or for a fundraiser. I've never seen Brunswick stew at the annual Barbecue Festival. It's a great dish though, and I do keep an eye out for churches cooking up stews in the fall. If you're looking for real North Carolina barbecue, then look for a wood pile and smoke in the morning. Actually, you don't even have to look. You can smell good barbecue. Love those hush puppies. Not the frozen ones drop and fried. The real ones made up fresh. I do like that Brunswick Stew. Just have not figured out how it fits with barbecue. Scratching head. That's like two dinners at once, and I'm not thin enough to do that very often. Pig skins . . . well, I was not even going to go there. Didn't think anyone would understand that. Yep. That's the max. Shhh. Let's keep that secret and eat all the skin. Hey I am down with the skin, my grandmother wasted nothing when it came to pig grilling! I am loving your blog, and now hungry for a good BBQ sandwich here in NJ wasteland of only Italian and Indian places...I will find a pig and take it down! Are You a Bad Barbecue Guest? Hum . . .